We are so truly excited to share this recipe with all of you. Perfect for a post workout meal, or to fuel you up for a busy day ahead, this is one of our favourite sweet pleasures. Our inspiration behind this recipe roots back to our longstanding love for banana ice-cream (aka nice-cream). 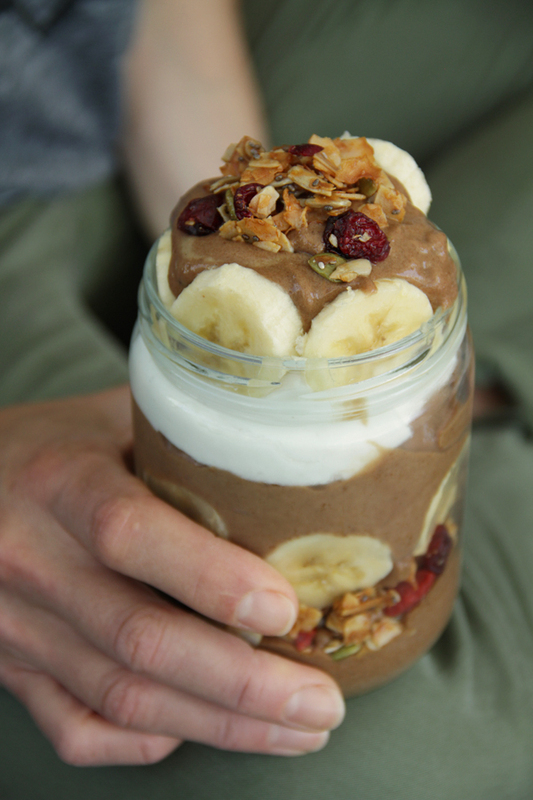 We have been experimenting and loving the results of blending frozen bananas together with other wholesome ingredients for years now. With this recipe, we take it step further and transform it into a healthy, high protein meal that feeds the body, mind, and soul. 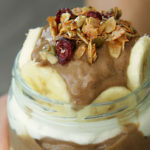 Layers of creamy chocolate banana ice-cream, blended together with a generous amount of maca powder and all topped with a crunchy gluten-free granola, this feast will leave all the senses truly satisfied, help balance your hormones and give you an extra energy boost. Maca (also called “Peruvian ginseng”) is a cruciferous root vegetable from the Andes, it’s an adaptogen, which means it can help the body adapt to stressors. For centuries people have been using it for everything from enhancing their fertility to boosting their immune system or libido, but most people simply love the non-caffeinated burst of energy they get from putting maca in their smoothies. The pleasant tasting root is usually available in powder and you will find it in most health food stores. Just one teaspoon in your smoothie once or twice a day can do amazing things. Add two frozen bananas, cacao powder, protein powder and maca to your high speed blender or food processer. Mix until thick Ice Cream like consistency is achieved. (Add a small amount of water to help mixing if necessary). Spoon about 1/3 of this mixture into a glass jar or bowl. 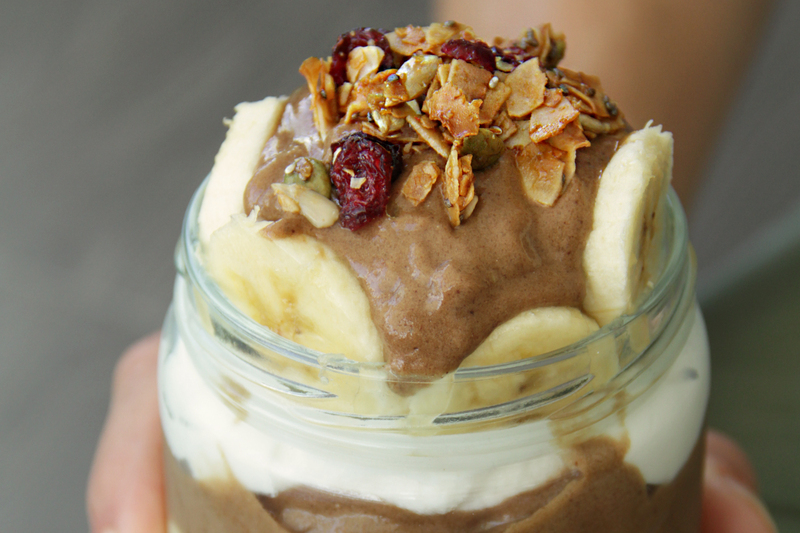 Add slices of fresh banana and granola to jar. Spoon another layer of Ice Cream in to a jar. 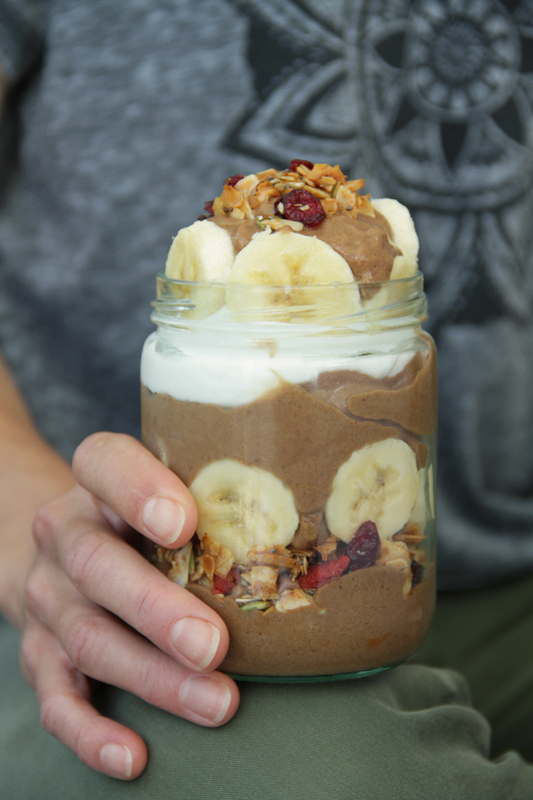 Layer with coconut almond yogurt (if using). Top with the last layer of Ice-cream and finally sprinkle a touch of granola on top. We hope you enjoy this creamy deliciousness!